Obama to Release Torture Report? 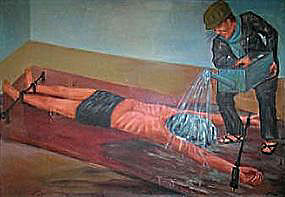 When the technique was employed on Abu Zubaida and later on 9/11 mastermind Khalid Sheik Mohammed and al-Qaeda planner Abd al-Rahim al-Nashiri, the interrogators in several cases applied what the CIA’s Office of Inspector General described in a secret 2004 report as “large volumes of water” to the cloths, explaining that their aim was to be more “poignant and convincing,” according to a recently declassified Justice Department account. ….Government officials familiar with the CIA’s early interrogations say the most powerful evidence of apparent excesses is contained in the “top secret” May 7, 2004, inspector general report, based on more than 100 interviews, a review of the videotapes and 38,000 pages of documents. The full report remains closely held, although White House officials have told political allies that they intend to declassify it for public release when the debate quiets over last month’s release of the Justice Department’s interrogation memos. ….Although some useful information was produced, the report concluded that “it is difficult to determine conclusively whether interrogations have provided information critical to interdicting specific imminent attacks,” according to the Justice Department’s declassified summary of it. Emphasis mine. Greg Sargent says that Hill sources describe this report as the “holy grail” because “it is expected to detail torture in unprecedented detail and to cast doubt on the claim that torture works.” Doubt probably won’t be enough, though. If there’s even a hint of “useful information,” I imagine the torture advocates will stick to their guns.